1 x R606SK searchlight bunker. Found this rather good close up of the anti-tank ditch but unfortunately this was all there was. It shows the ditch gradually being filled in but the right hand side still in remarkably good condition. 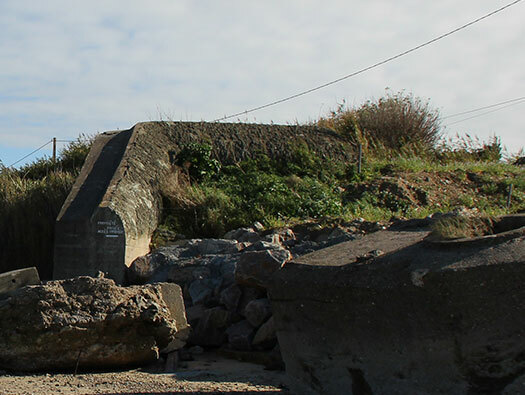 Anti-tank ditch on Omaha Beach. Walking in on the path from the modern housing estate. 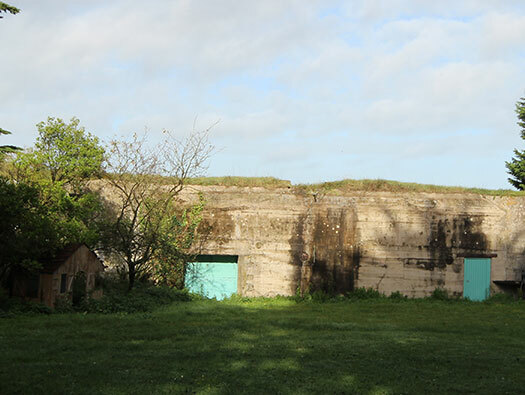 The three mounds R to L FA Unterstand for quarters, R134 ammunition bunker & an R606SK bunker garage for a 60cm searchlight. R606SK bunker garage for a 60cm searchlight. 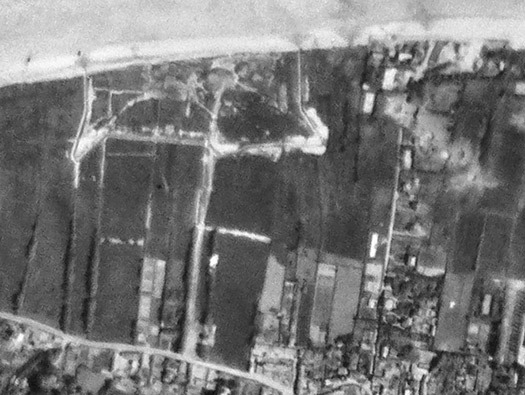 The FA/VF Unterstand could look like this but it is now covered in sand like all the three bunkers here. 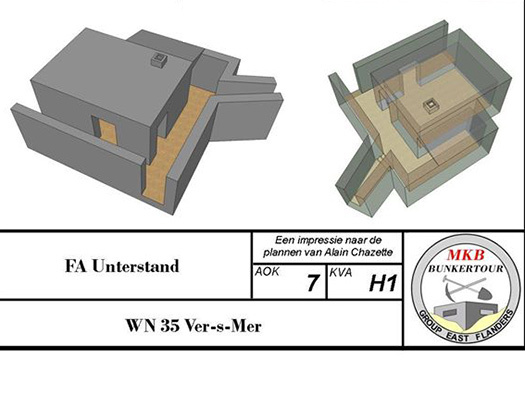 Plan of the VF Unterstand showing the small bunker with trench blast walls around it. Details supplied by MKB Bunkertour [Facebook]. This is what the R134 would have looked like but now covered in sand. A long passage running across the front of the bunker and two ammunition rooms off to the right with two 434P01 door split armoured doors. Passage with two doors on the left. 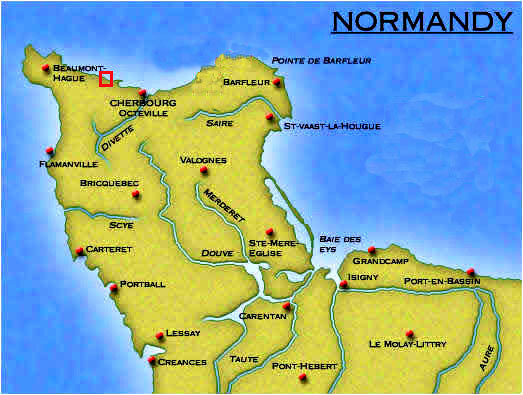 The main picture is from Wn92 Wigwam an SK, Isigny. 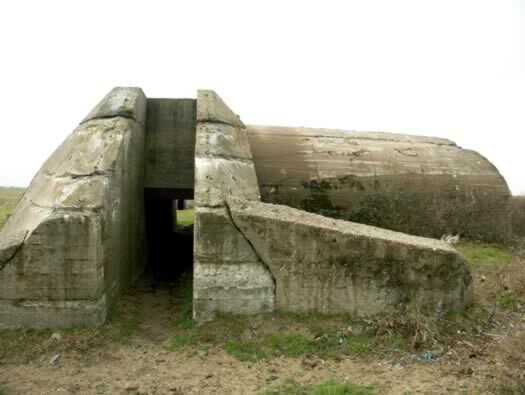 Its the same sort of style of bunker with a large door on the left for the searchlight garage and on the right the crew room. The one here R606SK is also covered in sand and inexcusable. Plan R606SK bunker garage for a 60cm searchlight. SK type searchlight garage at StP Kerlohic the picture is the chimney to allow hot air and exhaust fumes to rise out of the bunker, also as an emergency escape for the soldiers inside and the plan showing the exhaust passage and chimney. The path to the sands. I did not get a chance to see this one but tucked away down the beach on the right is a Vf67 Tobruk for a Pz.T.FT17 tank turret. The turret would have had a Mitrailleuse Mle 31(f) inside it. Vf67 Pz.T.FT17 from the air. 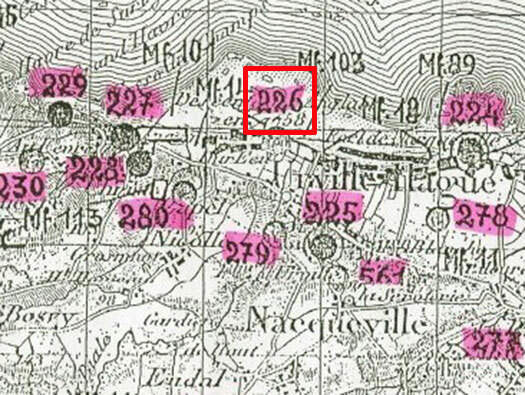 This is the German plan of all the Wn´s and StP´s and also MF mine fields with MF14 & MF103 around the defence. The FA Unterstand covered in sand. 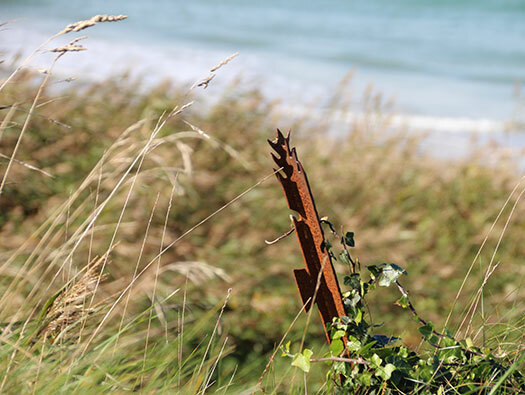 The gap in the grass is where I came through onto the beach and this Vf58c Tobruk´s sits almost hidden under the dune. Plan of a Vf58c Tobruk. Bits that may or may not have been left over from the war. 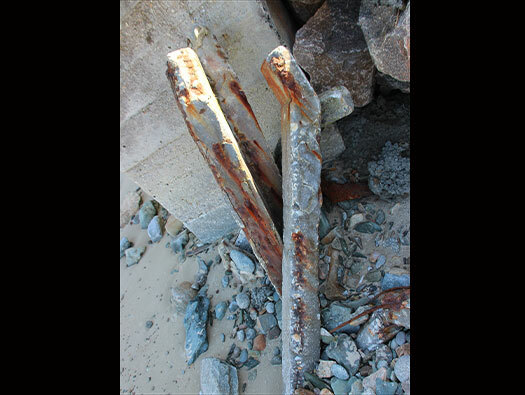 Two parts of a beach obstacle. 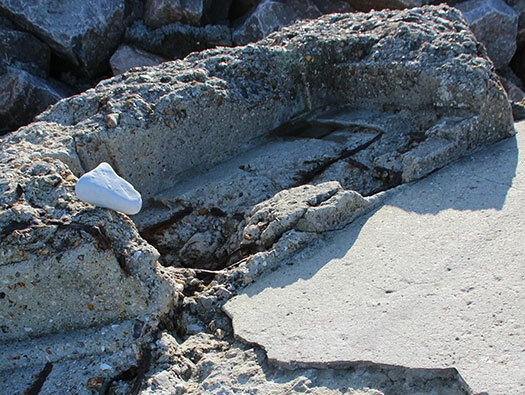 Assembling the six parts of this type of beach obstacle. 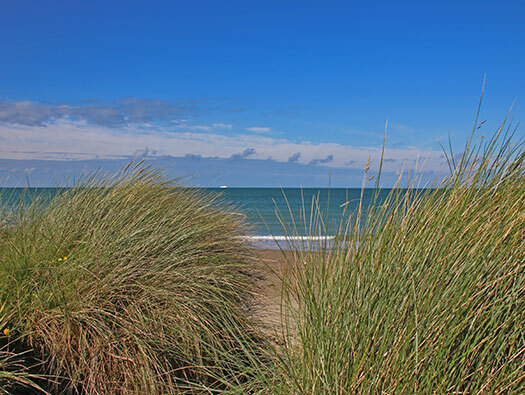 Looking down the left side of the beach to the major part of this defence. First the ringstand for a searchlight, R667 casemate and then an. nr.1694 ringstand. Beyond a Tobruk. 60cm searchlight in an emplacement. Left an ammunition niche, searchlight emplacement and another possible ammunition niche. Ammunition niche but I could not find any opening. Plinth to sit the 60cm searchlight on. 60cm searchlight sat on a plinth like this one. There are two niches either side but as this is not a weapons pit I do not know what they were for. Small niche possibly for a telephone connection to the bunker behind. Field telephone relay box socket. Wehrmacht Feldfernsprecher FF33 1935 original feldtelefon. This is the R667 casemate for a 5cm KwK L/60 gun. R667 rear entrance not hidden by a sand dune. 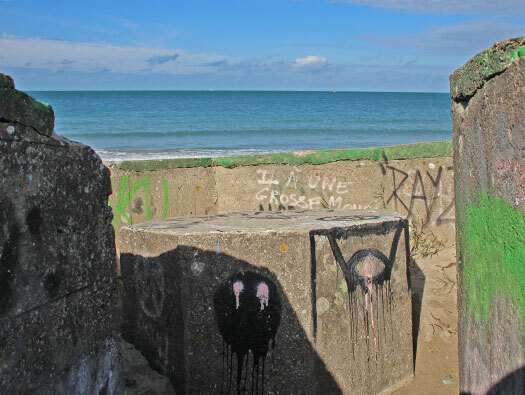 R667 casemate covering the western end of the beach. A very badly damaged Nr.1694 ringstand for a 5cm KwK gun. These guns were ex tank guns and very good they were but by 1944 they were redundant as all new tanks had 7.5cm & 8.8cm were being used. So as there were so many guns left over and a bunker mounting was made. First these guns were set into Nr.1694 ringstands, sometimes in much bigger ringstands with crew rooms below. Then to strengthen Nr.1694 some ringstands had a wall and lid to cover the seaward side of the gun. 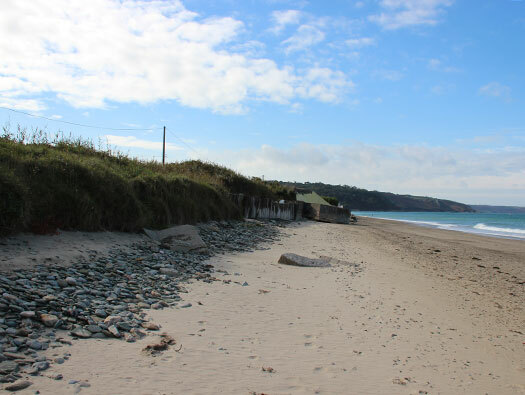 Several double casemates where the gun can pivot from one side of the beach to the other and last of all a casemate set to flank the beach an R667. Here the rough time line of 5cm KwK bunkers. Nr.1694 ringstand with a wall and lid added. This is the hold fast of the 5cm KwK gun. 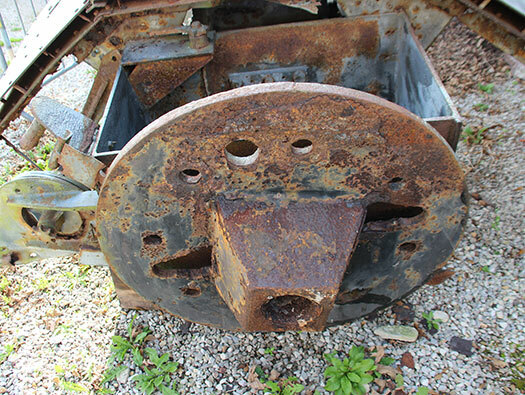 And the second picture is the base plate of the 5cm KwK gun (@ Fort de Roule, Cherbourg). The gun base fitted to the hold fast and due to have the gun fitted in the top. 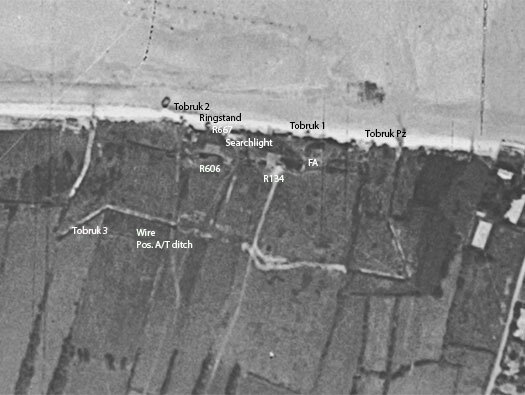 Tobruk No.3 in the field covering the rear. 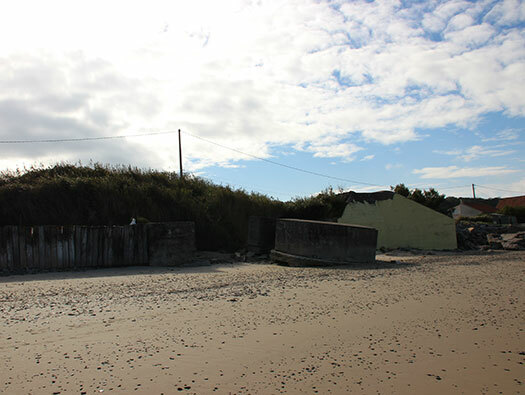 The main defence covering the western beach.